Are you driving one of these? If yes then your car is one of those that are hot on the thief's list. 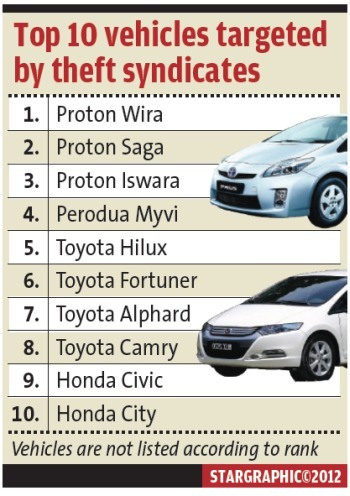 The Star reported that since 2010 thieves whisked away 112,503 cars comprising mostly Proton and Perodua models. The above list is not according to rank but it is strongly believed that four-wheel drive vehicles, especially Toyota Hilux are high on demand in the middle East. 4x4 vehicles are the popular means of transportation among rebel forces. Some insurance companies tend to turn away applications for vehicle insurance coverage for cars high on thief list. I have an experience whereby instead of getting Renewal Notice for my four-while vehicle, I received a refusal notice stating that AIG Malaysia (now Chartis) would not renew my policy. At that time a 'sibling' of the 4x4 model I was driving was known to be thieves' favourite. So there. Take extra precaution so that yours is not the next car in the statistics. @MaryaYusof. I agree with your point to certain extent. But I think it's the sheer volume of Proton and Perodua cars on our roads that contribute to the higher figures of stolen cars from these two makes. @tdhr. Harap2 dorang x jadi pencuri sampai pencen. @Aki. Ko punya wheelbarrow jenama Lamborghini kan. I had no idea about any of this!! thanks!